Current and former members of the State Attorneys General office from Pennsylvania, Massachusetts and New York State shared their role at the agency and their state’s plans for enforcing federal and state consumer protection laws during COMPLY2018. With the myriad of changes over the last year in administration and within regulatory agencies, the State Attorneys General have stepped up to take enforcement into their own hands. During COMPLY2018, current and former members of the Attorney General offices from Pennsylvania, Massachusetts and New York State shared their role at the agency and their states' plans for enforcing federal and state consumer protection laws. Nick Smyth, Senior Deputy Attorney General and Asst. Director for Consumer Financial Protection at the Pennsylvania Office of the Attorney General shed some light on this when he said their office works with the CFPB every day to find simple resolutions to the more than 22,000 complaints they receive each year. Jason Brown, Former Chief Deputy of the New York Attorney General’s Office and Richard Johnston also agreed when they said that contrary to what many believe, filing a lawsuit against a company is their absolute last resort, not the first. During audience Q&A, the panelists were asked about the top complaints from their states, and Nick Smyth took this time to remind everyone about the FTC’s annual Consumer Sentinel Data Book which takes in reports from consumers about problems they experience in the marketplace and uses that data to spot trends. In Pennsylvania, like many states, deceptive debt collection is the biggest cause of consumer complaints. Massachusetts said their biggest complaints come from student loans and New York from real estate followed by mortgage and bank fraud. Over the next couple of months, we can expect to see continued enforcement from states as they look to protect their citizens. If federal regulators step back, the state AGs have made it clear that they will continue to enforce consumer protection regulations in their states. 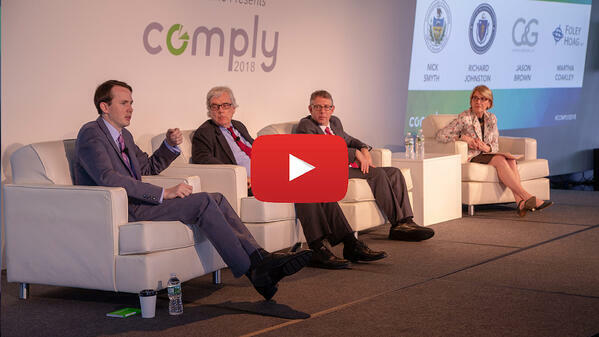 Check out the full video from this session that took place at COMPLY2018. For more sessions like that, look at our full on demand library, and join us at COMPLY2019. As a marketing specialist at PerformLine, Allison works closely with the client success team, contributes to event coordination, manages all social media channels and works closely with her team on all marketing campaigns. Outside of PerformLine, she enjoys traveling, being outdoors and spending time with family, friends and her dog Scarlet.